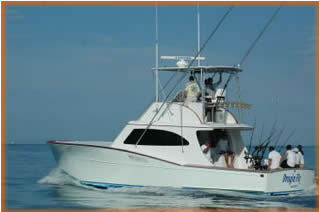 We are proud of our boat and crew have consistently been one of the top producing charter boats. 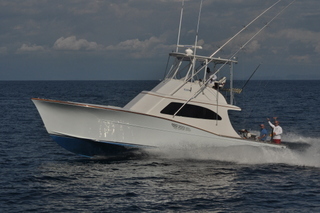 In January of 2008, The Dragin Fly was launched and has proven to be a fish catching machine, consistently one of the top producing charter boats. Costa Rica saw a huge amount of growth in the early 2000's as infrastructure improved, Los Sueños was born and the secret of Costa Rica's amazing fishing was revealed. The availability of top shelf boats with the best equipment and a crew willing to go the extra mile was very rare. In order to guarantee that the best was available to them, a group of partners built the Dragin Fly. 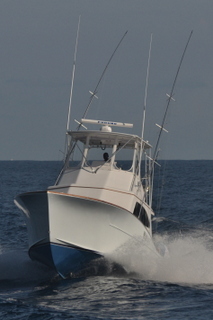 As a group of "good ol boys" we began successfully competing in billfish tournaments the following year, validating the team that we had put together and sharing the experience with charter customers. In 2013 we partnered with Capt. Jake Jordan for his Blue Marlin Fly Fishing Schools and under his guidance, the Dragin Fly has landed more blue marlin on the fly than any other charter boat in history. The Dragin Fly is a 25 knot boat outfitted with Shimano conventional, spinning and jigging equipment, Temple Fork Fly Rods and Mako Reels. We have the right tools and we do it right. We appreciate the opportunity to take you fishing and hope you enjoy the Dragin Fly experience. Contents of this web site and all original works are Copyright ©2016 Down East Guide Service, Inc. - All rights reserved.The material on this site, including images, may not be downloaded, reproduced, distributed, transmitted or otherwise used, except with the prior written permission of owner.